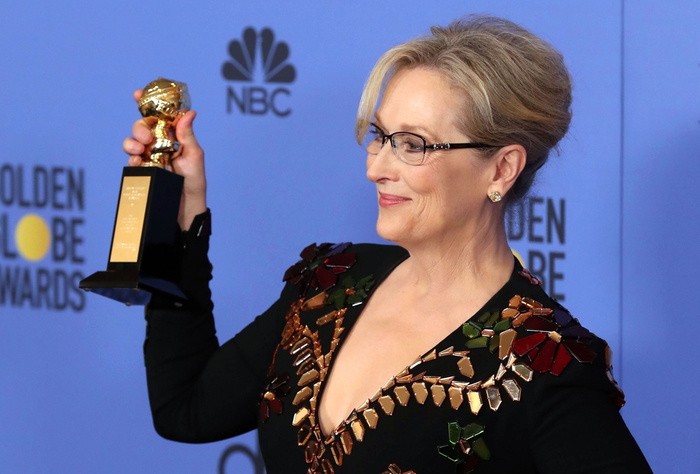 God, we were with you, Meryl. We really were. 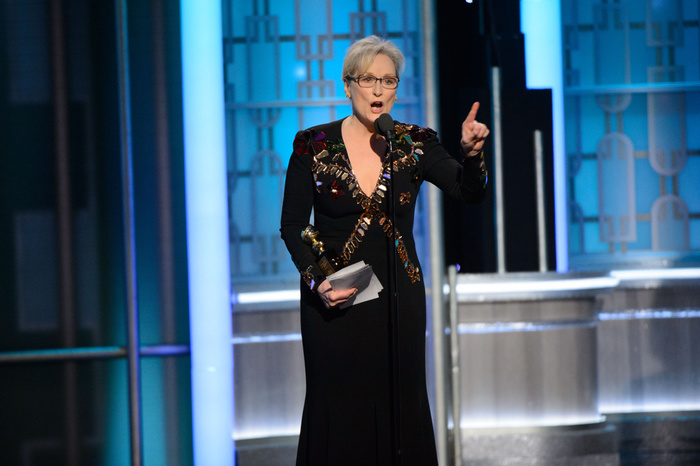 Last night at the Golden Globes when you were receiving the Cecil B. DeMille award and used your acceptance speech to shout down the new darkness at the center of the American political soul by celebrating the diversity of Hollywood, by calling on a “principled press to hold power to account,” and by tearing into president-elect Donald Trump for normalizing bullying and cruelty by mocking disabled New York Times reporter Serge Kovaleski on the campaign trail—we were with you all the way. Not since Adaptation were we so with you. Somehow you managed to do the impossible: mining hope and defiance out of an awards show. For that alone you deserved an award. “So Hollywood is crawling with outsiders and foreigners,” you said. “And if we kick them all out you’ll have nothing to watch but football and mixed martial arts, which are not the arts.” And the crowd cheered. Put aside for a second the numerous class issues raised by the image of an extraordinarily wealthy person getting a thunderous ovation from a room filled with extraordinarily wealthy people by laughing off the “brutish” pleasures of middle-class sports like football and MMA; ignore the irony of a woman who helped bring She-Devil, Death Becomes Her, and AI: Artificial Intelligence into the world implying that anything deserves to be condemned for artlessness; and forget that at almost the exact moment Streep was giving her speech, quarterback Aaron Rodgers was leading his Green Bay Packers into the second round of the National Football League playoffs with a exhibition of physical grace and subtlety that would have shamed Gene Kelly. After the first UFC events, once it had become clear that no single martial art on its own could be considered the greatest, that neither Japan nor Brazil nor Russia could claim a monopoly on the art of causing pain, the artists and innovators of the world went about the laborious process of cobbling together, in the most American of ways, something new: What worked was saved and what didn’t was tossed out, as were the cultural legacies and religious traditions and the million and one other historical burdens that conspire to kill the creative spirit by demanding purity. Oh, Meryl, history is the nightmare from which MMA was trying to awake! The same way musicians in New Orleans fumbled their way into a particularly American art form (according to many, the American art form) by combining English military marches, European opera, African drumming, and southern folk music to create something entirely new, mixed martial artists did away with all the notions of cultural purity that martial arts had always been saddled with, all those forms and costumes and rules, all that religious meaning and all those connections to the mystical world, to the metaphysical realm, all the suffocating ghosts and spirits and ancestors and superstitions of the old world—in order to discover the actual most effective way to fight! Like my ancestors escaping pogroms in Russia and Ukraine, like the Irish escaping starvation, like immigrants from Latin-America and Asia and the Middle East running from war, and just like your ancestors, Meryl, leaving behind centuries of suffocating tradition in Germany and Switzerland, America has always been (and, fingers crossed, always will be) a place where the burden of history can be shaken off and the virtue of diversity celebrated, not because diversity is a virtue on its own (though it is) but because it’s been proven over and over again to be the most effective tool for human evolution. And that’s why mixed martial arts, even more than Hollywood, is “crawling with outsiders and foreigners”: because it was born out of every culture and because its very nature, its very soul, is creative liberation. As I type this, the UFC has three African-American champions, two white American champions, two Brazilian champions, an Englishman, an Irishman, and a Pole. Competing in a sport that was created by blending together all the fighting traditions of the world until they were traditions no longer: just the ingredients and tools of a new American reality, free from the nightmare of history.